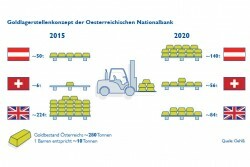 This year, and not in 2020, the OeNB Austrian National Bank is already concluding its repatriation campaign for half of its gold reserves. By the end of the year, 140 tonnes of gold are to be stored in Austria, with the other 140 tonnes remaining in London (84 tonnes) and Switzerland (56 tonnes). OeNB has been returning gold bars from London for three years and will complete the repatriation of half of Austria's gold stock (around 280 tonnes) from the UK this year. Austria has been taking gold bars home from London for three years. After verification of authenticity, these are stored in the vaults. This article includes a total of 623 words.